Self-titled “Tightrope Walker Cat” demands to be chosen, but I reluctantly pass, having featured felines on Days 38, 51, and 143. Instead, José Manuel Ríos Valiente wins with “Unexpected Wedding”, for candid capture and contextual caption that means everything. “We bumped into three weddings in our Italian trip”, he says. “but this one impacted me most, because the bride surprised all the tourists in the Piazza del Duomo throwing them the bouquet”. 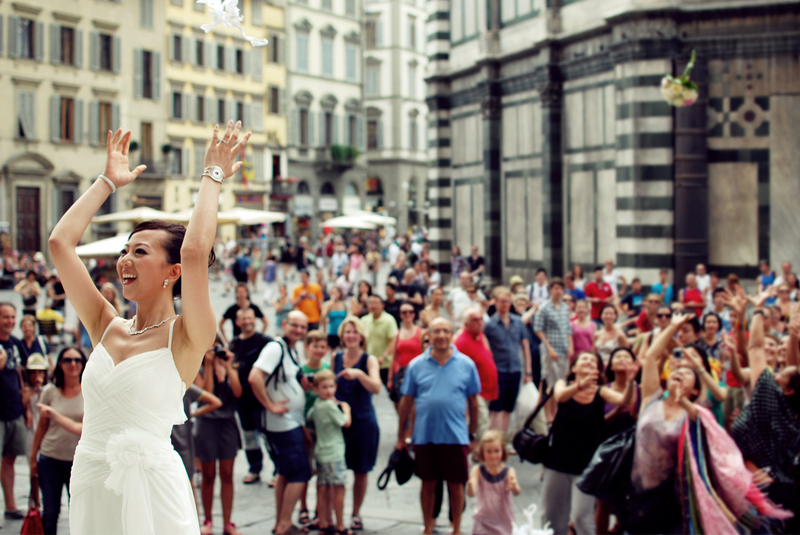 José captured the moment on Aug. 6, 2011, in Florence using Nikon D60 and 35mm f/1.8 lens. Somebody likes this photo, which has more than 43,200 views. Vitals: f/2.8, ISO 100, 1/500 sec. A video editor and photographer, José lives in Sevilla, Andalusia, Spain. He joined Flickr in August 2009.